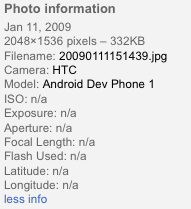 The Google G1 Android can geo-tag photos using the built-in GPS. Excellent. To record the location in the photo, start the camera application. The press 'menu' then 'settings' and select "store location in pictures". 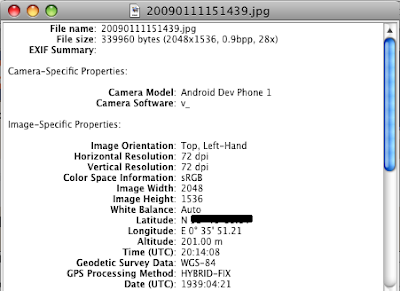 Then the camera will put the GPS data into EXIF. However its very hard errr make that impossible to get the geo exif information into picasaweb. First I wanted to check that the geo information had really been added to the file. I emailed it to myself, although I could also have enabled Mass Storage. Then I used the excellent EXIFViewer to check. Alternatively I could use Preview. Yes the data is there. I uploaded using Picasaweb album uploader, directly from picasaweb.google.com and from the picasa android application. Everytime the EXIF data never gets uploaded. What about the brand new Picasa OSX application? Nope. Doesn't even show the data. As the help page says "This feature is not currently available in Picasa for Mac." any news on how to make this happen?